Whether your home is in the old town of Georgetown or in a newer development in Georgetown, VK Roofing is your local Georgetown roofer with over ten years experience. 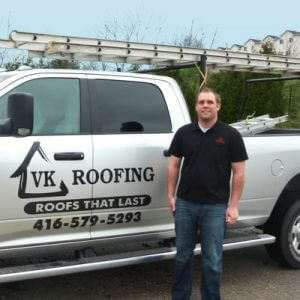 We are based in Georgetown and all work is done by the trained, skilled employees of VK Roofing – no subcontractors are used. Staff are certified in WHMIS and Fall Arrest Training. We are an Owens Corning Preferred Contractor. Georgetown residents turn to roofing expert Anthony Van Kooten of VK Roofing for roofing consulting and roof inspections, as well as for new roofs and roof repairs.